REDMOND — The St. Helens Lions took a lead into the locker room at halftime, but couldn't maintain their momentum. 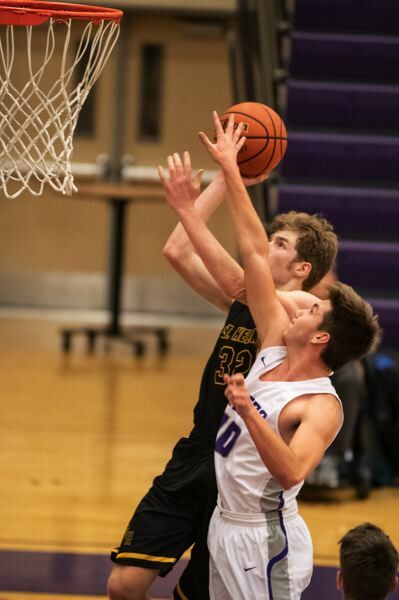 The Ridgeview Ravens outscored St. Helens 18-8 in the third quarter to take the lead, then never trailed again as they held on for a 52-48 victory on Wednesday. "We were up eight points or something (at the half) and we came in and said if we keep doing what we are doing we will come back and get a win," St. Helens forward Chris Beatty said. "But we came back out and didn't really do what we needed to do like in the first half and just let it slip away." With St. Helens starting center Parker Miller picking up two quick fouls, the Lions (1-5) struggled early with consistency. Still, St. Helens trailed only 11-10 at the end of the first quarter. Ridgeview starting center Payton Davis, a 6-4 senior, picked up his second foul early in the second quarter and went to the bench like 6-5 senior Miller, with the game tied at 15-15. With their big man no longer patrolling the paint, the Ravens (1-8) had difficulty scoring and the Lions took advantage, outscoring Ridgeview 12-4 for a 27-19 halftime lead. Davis came back with a vengeance in the third quarter, however, scoring nine points and grabbing nine rebounds as the Ravens took a 37-35 lead into the final frame. Miller continued in foul trouble, picking up his third and fourth personals in the third quarter, while fellow post Bryce Demars also got into foul trouble in the period attempting to slow down Davis. St. Helens coach Zachary Waldher was quick to acknowledge that Davis hurt his squad, but blamed much of the problem on the officials. "He did give us fits, but it also helps when you are leaping off of people's back, pushing the whole night and not a call against you," Waldher said. "I played in four different continents and all over the world in different places and I have never seen this worse officiating on a consistent basis in Oregon." Miller fouled out midway through the fourth quarter, while Davis drew his fourth foul late in the game. Still, Davis finished with 23 points and 17 rebounds as he almost singlehandedly defeated the Lions. "Parker, our big guy, usually he gets in those guys' heads and just takes them out and gets boards from them," Beatty said. "But it just wasn't happening, so when I got in I got over-the-back called on him (Davis) because I just got super low. "We had some flashes of people going hard, but it wasn't 24/7 like you need in a game." Beatty, a 6-4 senior, almost matched Davis in the scoring column, knocking down 22 points, but he managed only five rebounds as the Ravens outrebounded the Lions, 47-22. Junior Gavin Knoke, a 6-2 guard/wing, sank three 3-pointers for the Lions and finished with 13 points. In the end, the game came down to free throws. The Ravens converted on 6 of 14, while the Lions were 3 for 7. Waldher noted that the Lions battled adversity all week with several people missing practice because of illness. "I'm proud of these guys," he said. "Most of these kids have been sick all week ... whooping cough and all this other stuff, so it's been a rough week."